Nanoskin-F Facial Wand for collagen boosting, skin lifting, wrinkle removal, skin firming, nutrition infusing, skin massaging and deep skin cleansing. Comes with charging base, power cord, manual with three languages. With compact screen and control buttons, easy to use. Effective on skin improvement in 4-8 weeks. Shall be used with water-based conductive product, such as gel, serum or lotion (does not included). Four Functions: Deep Cleansing, Nourishing Infusing, Massaging, Collagen Boosting. Rechargeable: comes with charging base. Easy to carry in travel. Large treatment size: not only for face but also for body toning. Compact and beautiful design, easy to use, effective on result, good performance. 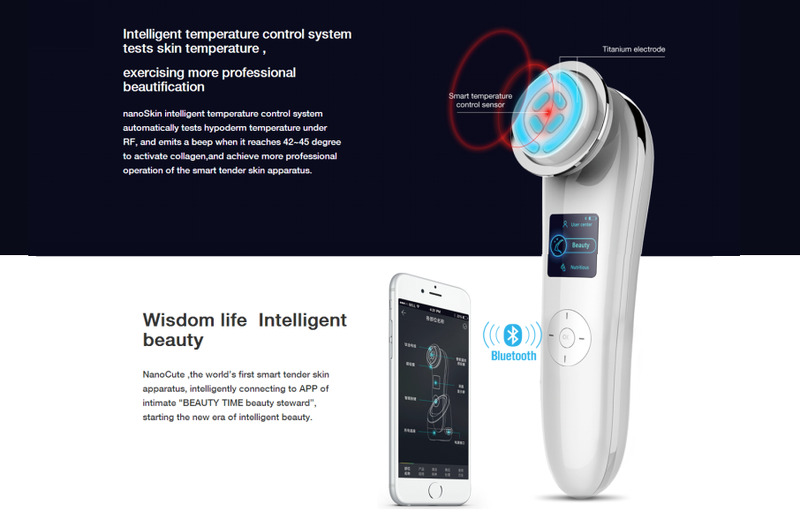 nanoSkin comes with built-in WIFI, Bluetooth, data storage module, and intelligent APP connecting to “Beauty butler” for monitoring personal beauty state. nanoSkin intelligently keeps record of the user’s skin care process, and also provides local data storage, beauty report review, keeping you clear with each skin care detail and making skin care more scientific and targeted. Customer may check user file, instructions, and video demo on the APP, intuitively and easily understands how to use cosmetic tools in the beauty salon. Smart push beauty advises, customer design based on your habits, it is the sweet beauty butler exclusively for you.